LOCATION.--Lat 43°02'09", long 76°10'54" referenced to North American Datum of 1983, Onondaga County, NY, Hydrologic Unit 04140201, on left bank 280 ft upstream from bridge on Holden Street at Syracuse, 100 ft downstream from gated outlet of Velasko Road Detention Basin, and 2.6 mi upstream from mouth. PERIOD OF RECORD.--June 1959 to current year. REVISIONS HISTORY.--WSP 2112: Drainage area. WDR NY-82-3: 1981 (M). WDR NY-88-3: 1986-87 (M). GAGE.--Water-stage recorder and crest-stage gage. Datum of gage is 391.16 ft above NGVD of 1929 and 390.60 ft above NAVD of 1988 (VERTCON). Prior to Sept. 18, 1978, at site 1,660 ft upstream, and Sept. 18, 1978 to May 31, 1980, at site 1,800 ft upstream, at datum 3.63 ft higher. REMARKS.--Flow includes some sewage and storm sewer inflow, some originating outside the basin. Since June 1980, flow can be regulated at Velasko Road Detention Basin 100 ft upstream. 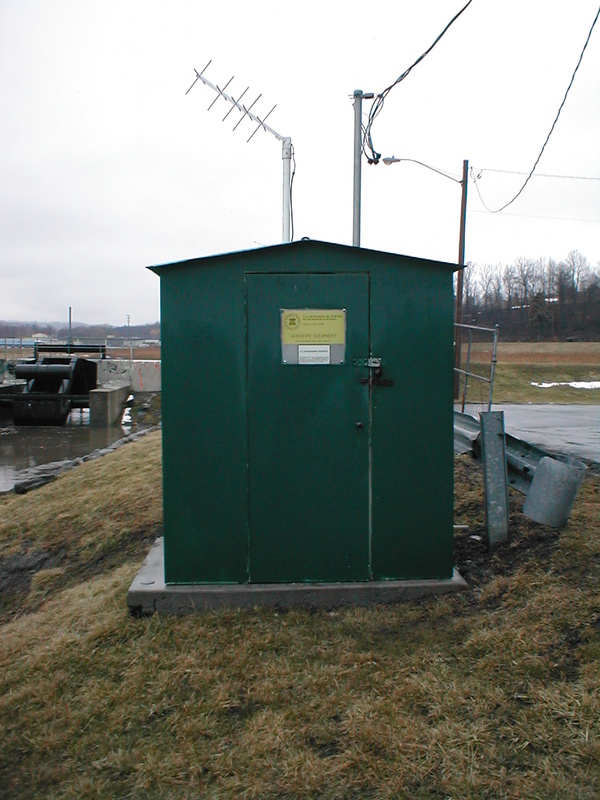 EXTREMES FOR PERIOD OF RECORD.--Maximum discharge, 726 ft³/s, July 3, 1974, gage height, 8.34 ft, site and datum then in use, from rating curve extended above 170 ft³/s on basis of slope-area measurement of peak flow; no flow for part of each day July 14, 16, 18, 1997, Aug. 20, 26, 1998, Sept. 11, 14, 1998, result of regulation for maintenance work in the channel.